Despite having a relatively strong primary health care system, Costa Rica still has many challenges to address. Mortality from circulatory diseases increased from 25 per 100,000 deaths in 1990 to 120 in 2010, and there was a 48 percent increase in all types of cancers from 2003 to 2013 . Consequently there is a need to increase health care capacity to provide comprehensive and integrated services to address these major causes of mortality. Montenegro Torres, “Costa Rica Case Study: Primary Health Care Achievements and Challenges within the Framework of the Social Health Insurance.” World Bank, 2013. Exchange rate: 1 Dollar equals 566 Costa Rican Colones. One of the most politically stable countries in the region, Costa Rica sets an example when it comes to Human Rights and conservation efforts. In 2018, Costa Rica marks its 70th anniversary since it abolished its military. The budget previously dedicated to the military now is dedicated to security, education and culture. Average temperature ranges from 70 to 81 degrees Fahrenheit so you can actually wear the same clothes throughout the year! Approximately 25% of the country has protected forests and reserves and there are more than 100 different protected areas to visit. Costa Rica is home to 6% of the world’s biodiversity. Its natural wealth, both in species and ecosystems, is partly explained by its conservation efforts as well as its geographical position, having served as a bridge of countless species of animals and plants for thousands of years. What to expect as a Volunteer? Our internship abroad trips start in San Jose where our teams spend their first night at one of our partner hotels. Orientation is held the next day and once it is completed, our teams travel to their designated communities. Depending on the itinerary, we stay in small hotels that are close to our work sites. In Costa Rica, recreational activities are full of adventure and adrenaline! From spending the day in a paradisiacal Pacific beach, visiting a National Park, flying over the tropical forest in a zip line, tubing in the canyon of a river, or spending the day in hot springs. Where do we work in Costa Rica? 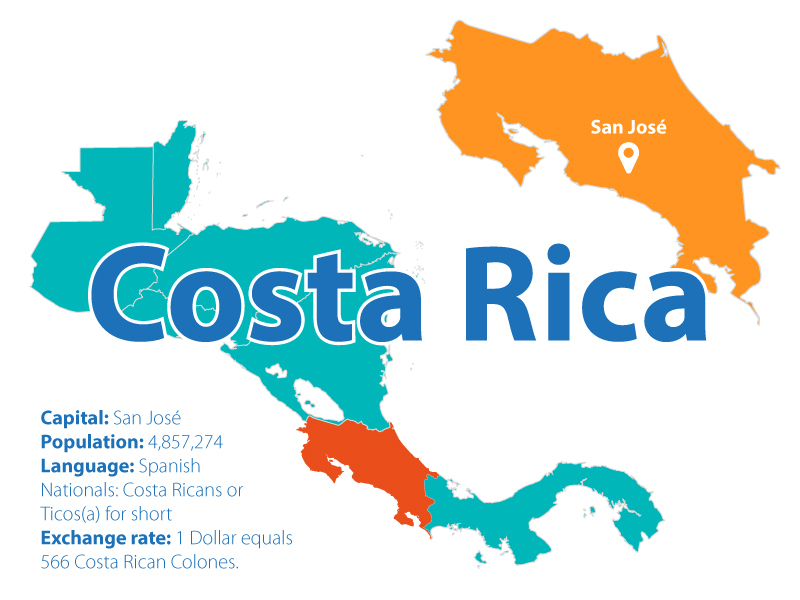 Costa Rica is smaller than Lake Michigan but regardless of its size, there’s a concerning inequality between urban and rural areas. Therefore, we focus our efforts on poor and vulnerable populations, where only 1% have access to some sort of Health Education. Most of our partner communities are located in Liberia, La Cruz, Parrita and Turrialba where we work closely with Leaders of each community to reduce inequalities and increase health literacy. Become a part of our team. Contact us today to learn more about our exclusive internship Costa Rica program! Vida Volunteer All rights reserved. Vida is a registered 501c3 charity.